Sorry again for the delay. The end of painting season here in my part of the world should benefit the audience of this site greatly! 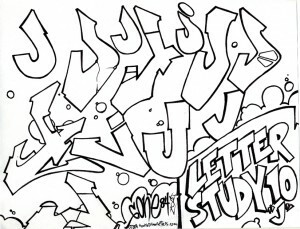 Anyway, here we have the tenth installment in our letter study series, the letter “J” in graffiti styled type. Once again, an extremely simple letter in its base form makes for a difficult time in adapting it to one’s on style. This nasty fish hook of a letter made for some very interesting trial and error. To be totally honest, this is the first letter study in the series that I re-did a few times before settling on a page that I liked! In the end though, it all comes down to practice. It doesn’t matter if it’s letters you are drawing or fish, the more you do it, the better you will become! Enjoy the latest installment and practice practice practice! 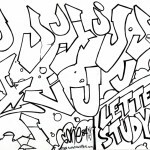 I just found your site tonight and I’m really hoping you continue your letter studies. I have been looking for something like this for quite some time and am really enjoying your exploration of each letter. Hopefully you will continue this series and help those of us that are new to graff, develop more of our lettering style.